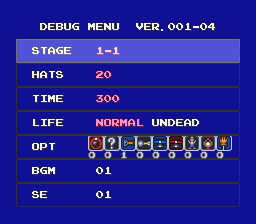 This game has a hidden level select. 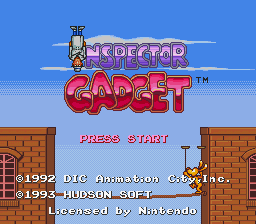 Inspector Gadget is basically Get Smart in cartoon form, complete with Don Adams in the title role. STAGE: Your usual stage select. HATS: The amount of energy you start with. TIME: Supposedly adjusts the timer, but doesn't seem to do anything. LIFE: Whether Gadget can die; "UNDEAD" is invincibility. OPT: Choose how much of each item you begin with. BGM and SE: As you may expect, a sound test. This page was last modified on 29 December 2017, at 16:11.